Around this time 40 years ago I had just landed in Lagos Nigeria. The Creative Musicians Big Band Troy Robinson Director . For days I’ve been revisiting the experience in my mind and wanted to relate a few things . Originally scheduled to happen in 1975 and or 76 But, there was an assassination that postponed the event. The band takes another break. The word comes back ”you cats need to go get your shots”. Meanwhile I’d be praying for this trip to happen, pray my self to sleep every night. Wow, we rehearsing again, the band is chosen and we are on the way. Out the door I tell my mom ‘don’t say anything if I write you and tell you ‘I played with Stevie Wonder’. We left L.A. to San Francisco to pick up dancers musicians visual artist onto Chicago and New York to do the same. This is the 2nd leg or other half of the 600 peoples of African descent to represent the U.S. slave descendants. Now you are starting to realize magnitude of this festival of Festivals. At this time 1977 Jimmy Carter is President, Andrew Young is the Ambassador or the U.SA. 75% of America is literally frozen from extreme weather conditions. Citizens of America were not privy to the information that the festival was happening. Of course the conscientiousness of most of America was forboden or unconscious to many truths that people are still faced with. The national fad or pastime for the masses was jogging, whilst governments and other agencies were doing there thing. Anyway, we are starting to get acquainted with the other participants on the plane. Wow, talking with Lerone Bennet Jr. Sr. editor Ebony –Jet magazine . Minster Louis Farrakhan from the Nation of Islam. Sun Ra and his Arkestra, his band members wanted to know who was playing the alto all the way ther. Nardi Dedmon). Nard played from L.A. all the way except for the stops . Only stop after New York was Madrid . I will have to do a video interview to reveal a lot of back drop information solely from my interpreted own experience, also, up coming information in this script . We Land !!! Armed Military everywhere . We are transported to Festac Village,14 miles around 8 miles wide rows of apartments to house all the participants from every last country on the continent of Africa and all descendants . Special lanes in the middle of the rode for the busses transporting participants. What a monumental task to organize. So, we got our apartments room keys settle in for the night. I’m trying to feel the significance of being here and all, nothing has manifested yet . Next Day, Sun Ra is reprimanding a band member of ours for playing all night ; after it was suggested to him by Sun Ra to cool it till the morning . It wasn’t Nardi. Won’t say who at this time. Our regular guy Wynell Montgomery went on the rode with Billy Preston so we picked Nardi and the reprimanded. Well, the drama was intense as sax guy tried to stand up to the Sun Ra, while his band members was trying to tell him “you don’t Talk to a master like that. Ra would talk about the god Sun Ra calling father when he visited the inside head of the Sphinx, -much much more, all being corroberated by band members. I don’t know what to think. Sun Ra said if this guy performs he will not in Africa. Okay mmm? What -,whats to say . Later in the afternoon the U.S. contingent was transported to the Secretariat Building. Along the way Sun Ra spoke pointed out some graveyards and spoke about John Coltrane wanting see the face of God . We see the National Stadium ; built in the form of a generals hat.55million was spent on that as I understood it . You have to remember Nigeria was the 2nd largest oil producing nation on the planet at the time . The General and Colonel Olusegun Obasanjo also greeted and energized our presence. Next Day free to move around trade ,take it all in whatever you can understand about you being a part of this . Something going all the time impossible to see all the events, see what you can . Saw Mariam Makeba that night . Were Talking Camel races in Kaduna and festivities in constant . way . Now we our near the Shrine its still some daylight, alleys with bails of weed and pre rolled spliffs called Jumbo’s -jambo’s . Learning Fela’s bass lines , next we are in the compound . Culture shock all the way , Heavy --- his wives dancing around while I’M BLASTED OUTTA MY GORD. Fela comes out 2am dressed sharp ! and, taking every one across the street to the shrine . ( refer to video ) Earlier that day we signed up to be Young African Pioneers Y.A.P. , In the Shrine !!! Also the name of Fela’s Newspaper Y.A.P. news . I noticed while signing up to this organization my friend put his name down as Miles Davis , started to occur to me that was a good idea to not put your real name down. I realized now, Fela was on the original committee for Festac and resigned for his reasons. The YAP paper had his image with barb wire across his face signifying his boycott of the festival . It was a lot of disorganization ,but what do I know I’m in Africa. Fela and the African 70 completely blew me away . I’m still going through culture shock . ( video ), I realize I’m in a real revolutionaries house who is a musician. Vibe, thick and heavy ,a feeling of never wanting to leave but scared to go back there . Could it have been a lot a tension in the air between Fela and Government ? Speeding up – Fela sent a car for us everyday – I’m orientated. I’m walking about in the apts (festac village )I see Stevie Wonder sitting by himself on the porch , Like, is that Stevie ? I GO OVER and converse ,how sweet this is. We also had a mutual friend Thoko ,who taught him Zulu translation for I Am Singing ‘ Key of Life album . Before I know it the people are gravitating over to his energy. But, we had discussed the possibility of playing ,he bought it up ! I’m stoked ,shits happenin fast! Kologbo tells us to be at the Shrine tonight .Ok , now the chaperone is saying the U.S. Contingent must meet at the cafeteria so’s we can give thanks as a whole , which I haven’t a problem with that ,I was told to past the word as I just finished visiting with Stevie .Incidentally,she was apart of that gathering crowd. So I say ,” will Stevie be there?” She did reply yes , I was content enough to pass the words to my constituents and band and whoever was black from America. Yes be there . We all held hands giving thanks that we were here ;in Africa, a part of the Festival ; something so beautiful so Spiritual you cannot grasp the magnitude of what it is , what it means to ones self and how it could and continue to effect the rest the world . Yeah , Lost for words ;but we all hit a pitch of an Ohm together to sound and vibrate thankfulness into the Universe. Did not leave the village after that.But ,Stevie was not at the gathering. So guess what ? Kologbo (Fela’s guitarist) shows up in the morning asking us where were we last night.” Why you did not come to the Shrine”? In the middle of an explanation he says Stevie was @ the Shrine last night . Damn , missed it. Stevie went to pay Homage to his brother Fela !! Stuff is happening fast .that day we grabbed our instruments went Fela’s and played in his backyard , he joined in on trumpet in is Bikini underwear . So we bring our stuff back and return to the shrine that night for the performance . So much to say I have to reserve stuff for video interview ;any reference to ideology , philosophical interpretation ,spiritual connotations and the ladder can and will be discussed in the near future . Before we left the compound Fela tells us to come band rehearsal tomorrow and he would share how he write his material. Done deal as far as I could know . Next early afternoon Troy says get the cats together we have to go play at the Embassy for Andrew Young . Awe hell, here we go- We told him know cause of thwe Fela invitation. After some mulling over the situation we decided to go play . It was wonderful and we got a chance to hang out and talk with Andrew Youg when things were winding down. But at the height of that party we reunited with Stevie and He invited Harvey and me to his suite to discuss a performance he e’d had in mind. The brother gave us the address ,we bailed off the bus not telling any of the band what was up . Unfortunately , Stevie’s brother left out 1 letter of the street name and now we’re lost .A lady named Dorothy ( my moms name helped us find our way to Festac village . Talk about being bummed out !.The next day we set out with Kologbo to go to AJ.s house an Black American eigineer living there.After all his talk had been exhausted we all felt the need to get back to our apartments . Soon as we arrive we see Sanders ( percussionist ) standing oput with his stuff. Whats up ?I’m going to play with Stevie Wonder – Well I know I’m playing –was invited by the Man . In the Interim Stevie had picked others to play as well . We got our stuff ,inside 20 minutes a little van pulls up ,we load up and drive 100 yards to this bungalow . Low and behold Stevie was right there.Stevie senses Kologbo is in the room calls out Kologbo answers yeah man I here . To make along story longer we rehearsed an hour in a half anon the way to play at the National Stadium filled to capacity.Shared the stage with Osa Bisa Hugh Masekela and Violinist Michael White . What a night; After the concert we went Stevie’s Suite greeted by Minister Farrakan. Who watched us on the television and congratulated us on how great it was . Before long Fela barges through the door with 6 or 7 wives .Its on , gthe ladies pulling jumbos out the purses. Fela and Minister Farakan on the balcony talking , the Chief Priest Fela talking loud too! Communing with Stevie on the living room floor ,closest thing to nirvana. Next day Fela reprimanded Kologbo on stage for playing a Festac event ;enen if it was Steveland Morris. To be in the vortex of all this positive spiritual energy , whereby your thoughts could manifest in reality instantaneously, or before you could expect them to .It was movement some type of universal synchronicity.Have to speak on that too! How I got my Yoruba name ‘Balogun ‘ Harvey Estrada is Anikulapo Kuti after Fela .And, what it was like for me and my experience around Fela’s environment. Wow its so much! 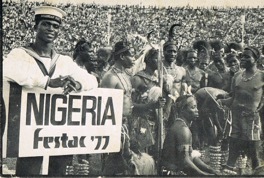 Next Day Festac came to the Kalakuta Republic to the African Shrine . Michael Veal speaks about this day in his book ‘Fela’ .The Creative Musicians performed along many groups.One thing is not so mentioned is that over the stage of the shrine is a sign that says BLAKISM IS A FORCE OF THE MIND. Now It’s a few things I wanted to let Mr. Veal know about that particular night. Also , what the flashpoint or ignition that would quickly culminated into an raid on Fela’s house .Besides the tension between the President Fela and the Nigerian government.this particular day an army guy was the a driver for the van that took us to Fela’s compound . He did not want to take us but did . His mistake was to slap Kologbo for his personal reasons kologbo being a star and all. I have to tell you how that went down too.Who was there and so on. Guitarist Kevin Johnson was in the van with us . This is where the fuse was lit . (refer to video) They actually waited to for us to leave the country and executed the raid. Fela lost his Mom in that mayhem.